A collection of plant inspiration. As summer winds down, it’s time to consider your fall planting strategy. As fall approaches, it’s time to start planning for the planting season. We have a number of informative posts right here on our blog that will help you consider and select uncommon, water-wise and native plants for your upcoming project. From trees to ground covers and California natives, this collection of plant inspiration offers plenty of options that are worth a look. Trees provide the essential structure and foundation for any successful landscape project. If you’re looking for some out-of-the-box inspiration for uncommon trees, take a look at these recommendations that are anything but ordinary. What’s a landscape pro to do when a project’s success depends on life giving water? If there’s anything we’ve learned after years of a challenging drought, it’s just go native for a beautiful, water-wise landscape. For Bay Area projects that require low maintenance and water efficiency, nothing could be better or easier than succulents. 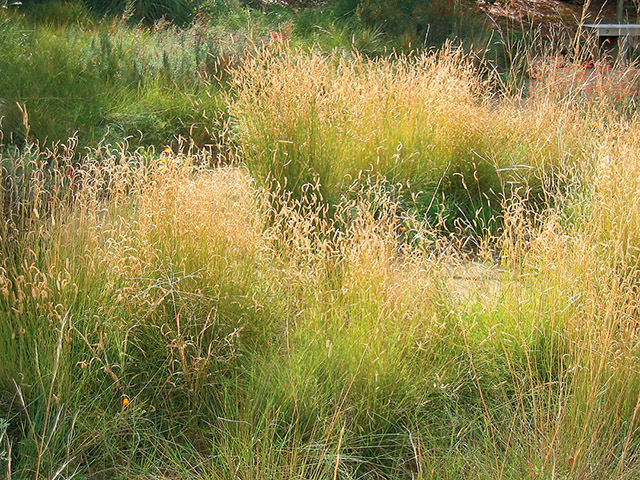 With so many aesthetic and ecological benefits, it makes sense to consider these 7 California native grasses for your next installation. Replacing turf grass with other water-wise plants is a drought-conscious option that’s catching on. Consider one of these great ground cover alternatives that are much more aesthetically pleasing than a dried out or weed infested lawn. Want to know what’s in bloom and looking great right now for your project? Our Prime Plant List is an easy-to-use summary of items we have in limited availability and prime seasonal condition. All of them are available for immediate purchase or delivery. As both a grower and a plant broker, we’re ready to work with you to provide the right plants that will make your project a success. Contact any of our experts online at Pacific Nurseries or just call 650.755.2330. What’s your water-wise, fall planting strategy? Share your plans or your favorite plants with our community of Bay Area landscape pros by leaving a comment below. We look forward to hearing from you.